The day started with a pilot meeting at 9AM where we firmed up some of the technical issues such as min. distance, nominal dist. and time, criteria for scoring stopped tasks, etc. The WCPC is a small field this year with only a few more than 40 pilots, but the field is filled with good pilots. When we arrived at launch the skies were overcast with high cirrostratus that blocked much of the heating. The South skies were still dotted with very unstable looking Cu's that showed there was potential for the day, once the sun was allowed to heat the surface. A 42km task was called from Woodrat Pk to Rabies to Burnt to Grant's Pk to Trovin (9k S of Grant's Pk). I launched early and got up high, only to get flushed about 10 minutes before the start time. I was able to salvage the start, if a bit late, and made the glide across to Rabies. I could see that the leaders were not doing well at Rabies, and many pilots were diving back into the valley, so I went into a very conservative mode and took a weak climb over the middle of the valley that gave me another 600' to play with when I got to Rabies Ridge. The ridge was classic Rat. The air was very trashy and unpredictable. There were areas of bullet-like lift and convergences that made or broke your day. I was able to hang in the unorganized lift long enough to team up with Paul and Steve. We found a core and climbed, quickly to 6000' which gave us the ability to head over to Burnt Ridge. I'd estimate that at least half the field fell out in the first 10km of this task - it's amazing how difficult the 4-5km transitions to-and-back-to-Rabies were, do to the low climbs and wicked sink. Once up at Rabies again, I headed North-West to Grant's Pass. The distance ticked down and the winds were very light at altitude. Abeam goal (about 7km. from Grant's) I was able to get a slow climb that appeared to put me in good stead - UNTIL I hit the wall. A wall of wind from the West became an insurmountable barrier to further progress towards Grant's. Every Serial-class wing ended up here and the wall was even unsurmountable for any comp gliders that came along after us. We were done. Results are now out and Farmer won the day with Matt Dadam, Nate Scales, Josh Cohn, and Nick Greece next. I place 4th in the Serial Class and 15th overall. Happy to make it that far. All-in-all the task was well suited for the day. It was tough on the 1/2 & DHV 2 wings during the first part of the task and that's the nature of this valley. Results will be HERE as soon as they are available. My flight is located HERE. After I got back to my room the skies opened up - here's a bit of a taste of the tropical conditions this evening. The next couple of days look less conducive to long tasks, but the Rat can be a trickster. Today looked unstable early and we all knew it would over-develop before the day was done. The cell above was 20 miles East of us, near Medford, and it was late in the day before any over-development affected the Ruch area. I launched early again today and got up easily. I headed across to Rabies and soon found a great thermal to 8,500 ft. Most of the collective wanted to go to Grant's Pass again, but I wasn't that motivated to fly the route again. I headed on course but turned and went to the West to make a triangle. I ended up an the Longsword Winery and enjoyed a nice red after packing up. My flight is HERE. Tonight was sign-in for the WCPC and it looks like most of the regulars are here. Tonight the skies opened up with a very active lightning display and gully-washer rain, so the weather for the week is in doubt. I'm hoping to see some good short tasks early in the week and longer stuff when the instability eases. Wish me luck. Tonight this blog had its 20,000th hit since its inception 17 months ago. The 20,000th hit was the 8,646th unique visitor. The hit came from Bucharest, Romania. Kinda cool to see where and when people view this blog - You can click the map at the bottom/right corner of this page to see where folks are from. I started this just to update my family while flying various competitions and it's grown from there. Hope you find it worth while (sometimes). Today was a great day in the Applegate Valley. 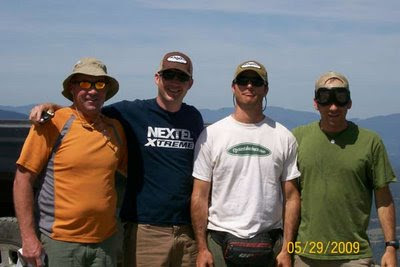 I met up with Andy Palmer, Rob Sporrer, Nick Greece, and Matt Beechinor at the LZ. Tim drove us to launch and it looked good with cumulus clouds popping all around us. A couple students were in the air for a while and managed to find some lift at launch elevation, but it took an hour or so for the cycles to start, weakly, coming up the face of launch. I launched first and managed to find a weak thermal that teased me as I drifted around the area trying to get up. I was able to hang for 15 minutes when I found a bubble that took me to 4500' and gave me the freedom to look around for a boomer. Meanwhile Farmer and Nick had launched but they immediately had to deal with a down cycle. Rob and Andy and (the other)Tim launched a few minutes later and also had problems getting up. I was fortunate to be high enough to hang in the weak lift until Farmer worked his way up. We headed across to Rabies Ridge where we contacted some well formed convergence based lift. At this point Farmer headed out & I stayed with the lift until it topped out at 8600'. 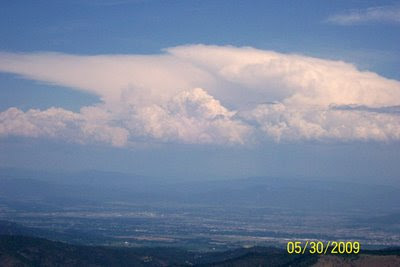 The clouds were still North and East of the direct course to Grant's Pass, but that's where we were going. I spent the next hour about 1/2 a thermal behind Farmer as we flew towards Grant's Pass. I feel bad because I really didn't contribute much to the flying, but it was a fun outing. We turned just short of Grant'sPass and decided to try to get back to Ruch. I was low man & wasn't willing to hike far (with my bum ankle) so I headed for a likely thermal trigger nearer the main road to Ruch. I got low and landed in a great field across the road from the Noble Dairy. After 45 minutes next to the road, displaying my 'GLIDER PILOT NEEDS RIDE' sign, Hector stopped to offer a ride. It was a fun day with a 24 mile flight in warm conditions. My flight track can be viewed HERE. 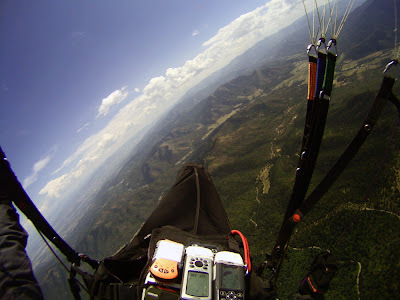 Tomorrow is registration day for the West Coast Paragliding Championships so I'll need to get back in time for that. As in, "Tim can be a dipshit at times!" - I hope the reference isn't the 'despicable' definition! What this means to me, is that it's "GO" for the WCPC next week. I'll be flying my Gradient Avax XC2 in this comp because I have had only two short flights on my (newly purchased) Boom 5. I enjoy flying the Woodrat area because the flying is very technical. Pilots need to plan the flight and read the conditions as they change throughout the period of the task. Valley winds, areas of convergence that run for miles, and massive areas of sink, are all variables that can either make or break you. I've flown 3 or 4 comps in the area now and am looking forward to it. The Ten-Day-Forecast for the Woodrat area looks a bit wet. I hope that this is an indication of great clouds, rather than a week of rain. It still looks good enough to get some flying in early and mid-week. I'll be blogging as usual. Here's a video I put together that shows what it's like when thermalling with 70 other pilots before the start of the task. The video also has shots of many of the competitors and podium shots of the winners. Thanks to Aaron Beck and Dean Stratton for sharing their photos. For the best quality version you can right-click and save the .WMV file at the bottom right corner of the Vimeo Page. 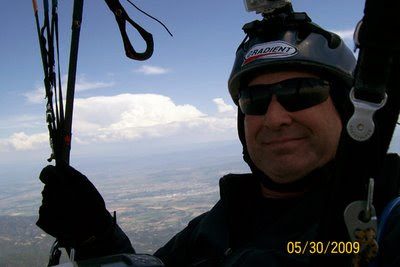 2009 U.S. Paragliding Nats - Dunlap, CA from Tim O'Neill on Vimeo. 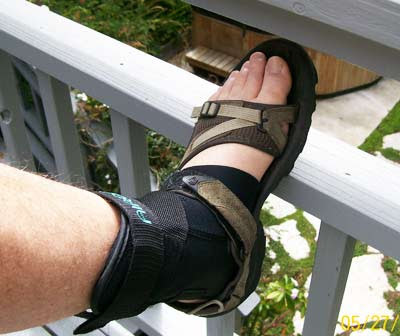 A friend who has been an occasional instructor, guide, and initial responder when I banged myself up in Mexico a few years ago, has had an accident while running a clinic in Florida. Dave Prentice is a great pilot and a great guy who has dedicated much of his life to the pursuit and promotion of foot-launched free-flight. David and Rasa have a new son named Sky and live modestly on the proceeds of his mentoring and guiding paraglider pilots all over the world. David's injuries are not life threatening, but included some surgery and hospitalization and his recuperation will cause some interruption in his income. I know that David and Rasa can weather this type of storm better than most, but the bills for his medical treatment will not be inexpensive without insurance. David's website will soon have info about his progress. Get well David and I'll see you on the hill soon. I found this quote to be in complete resonance with my paragliding experiences. Trips worthy of being called journeys must provide opportunity for virtue. Resourcefulness, judgement, courage and luck must all play their part; temptation must be resisted, false friends identified; skill, analysis and technique must all make a difference. Battle, alliance, rest, fear, thirst, heat, discomfort, reflection and just a few moments of lucidity have to find their place. The efficiency of a means of transport should be measured by how little you need to travel to still make it a journey; maximise journeys per mile, not miles per hour. If you are how you travel, remember to maximise your journeys per mile, and only then aim to ramp your miles per life. As reported in my previous post, the fifth task was a bugger. Conditions at launch were very sketchy for a long time. 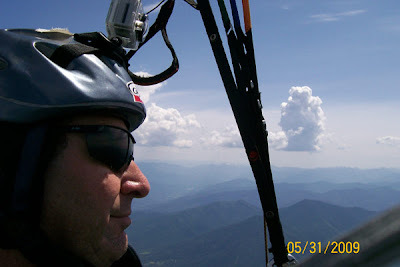 See a photo on Andy Macrea's blog showing conditions at launch. Even when the clouds rose high enough for launches to begin, conditions were weak. The sky shaded over just after the start and this caused most pilots to land before, or just after the first turnpoint. 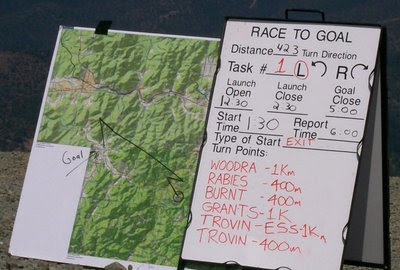 The task results are in and the task was drastically devalued because so many competitors landed within the first 10km. No one made goal but Nate Scales and Josh Cohn were within spitting distance of making it. Nate and Josh only got a little over 300 points for their efforts. No changes to the top 3 in any category. I placed 26th overall. I am happy with my decision making made on the first 3 tasks. When conditions were weaker, on the later tasks, I made some decisions that committed me to routes that, ultimately, didn't work out. This comp was held at Dunlap with the hope that the competitors would leave with a yearning to fly this site in future events. The weather, terrain, and great tasks all made for a wonderful week of flying. The St. Nicolas Ranch also worked out well in providing a comfortable communal environment to eat, sleep and party. Jugdeep Aggarwal did a great job in planning this event. He even left his wing in the bag to ensure the meet was safe and successful. I know how much Jug enjoys competing and appreciate the sacrifice he made for the good of the other 70 competitors. Bill Hughes was a painfully patient scorer who worked long into the night to provide scores for the morning briefings. John Ivey served as safety Director and did a great job even when he had his hands full with 3 reserve tosses and the incumbent pilot extractions. No injuries resulted from any of the irregular ops. Connie Locke, Sonnie, and their group of retrieve staff did a good job of getting the pilots back to camp after a "break-in" period, in all this was a successful and enjoyable competition. Congrats to Brad, Rob, and Eric for flying very consistently and showing the way. The weather was dreary when we arrived at launch around noon. Cloudbase was at least 400' below launch and the visibility was a half mile. We waited it out ans finally called a 38K task - A 2k Exit start around 49917 then out to wolver (near Squaw Valley) then down valley to Woodlake. Cloudbase was just barely higher than launch so things were a bit interesting before the start, but lift was abundant and I had no issues with the call to fly the task. My start was a good one and I was with a contingent heading directly along courseline across the Dunlap valley. The other group was working from 49917 to Bald and then out to Wolver. My group included Dean Stratton and Babush so I felt the gamble was a sound one. We had the potential to be 5-10 minutes ahead of the Bald group *IF* we could contact lift along our route. It looked good with dark spots under the clouds, but nothing substantial was found by the collective. Meanwhile the Bald group was able to get up to 5000-6000' over Bald and continue on course while my group slowly dwindled as we landed one-by-one. I found a bubble of warm, buggie air with thermal birds buzzing around and was able to hang in there for 15 minutes before falling out and landing in a nice field with 5 other pilots. Dean made it over to the other side of the ridge but also landed - our gamble had failed. It's been a great comp with 6 straight days of flying and one canceled task. The conditions have been very good. More to come after the awards party tonight. Prefrontal conditions obvious at breakfast. We hustled up to launch hoping to get a short task in before theskies opened up - We almost pulled it off. 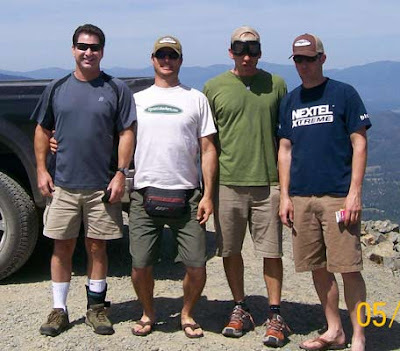 A task was called down to Orosi then back to the pizza place at Squaw Valley. About 40k if I remember correctly. The rain gods won this one & quite a few guys got wet, either while flying or packing up. When the task was called a bunch of guys were nearing Orosi. The weather events allowed us all to get to camp early enough to blow off some built up steam. The margaritas were expertly prepared by Steve Forslund which made the comp experience complete. It's Sat. morning and the skies look good for one more task today - I love post frontal conditions in this area so it should be a fun day. Today's weather looked much like yesterday's with light winds aloft and a fairly stable airmass. We still built a big task since yesterday's flying was better than anticipated. The pre-start gaggling was desperate. We were clinging to the ridge at 500'over to 500'under launch height. There was much conversation in the thermals as we all attempted to get high enough for a reasonable start that allowed us to get to Hill 49917 high enough to surf up it's face to get the 400 meter cylinder. Once on the way to Squaw valley, the gaggles thinned and the work began to hack away at the 50 mile task. Squaw Valley had some lift and we worked together to find the best core. Top of lift was around 4000' so we had to climb often and got much lower in the valley than yesterday. It was a scratchfest. My undoing was a ridge with the Cliff waypoint on it. I got up and was waiting for a couple others to get up so we could leave together, when I got hammered with sink. I came in under the others and couldn't connect with the thermal that I had previously topped. I was within 500' of landing when I found a weak thermal that got me just high enough to dive into the lee of the ridge and I was on the ground 15 minutes later. My favorite retrieve driver, Phyl, soon had me in the van and we headed out to find others. We had 5 in goal today. Quite a feat. I placed 34th for the day and don't know how this will affect my hold on 20th place. We'll see tomorrow. Unfortunately we had a mid-air (strangely, it was after the start when traffic had thinned out) with a reserve deployment. And another reserve was thrown in an unrelated event. All pilots are OK and planning to fly tomorrow. Today’s task was a ridge run twice, along the ridge that launch is located on, then out to Squaw Valley and South to Lindsay. Total task length was 80km (50 miles). I was looking forward to this task because I lived with my girls in Visalia for 25 years and would be flying just East of Visalia if I made goal. The start went OK but I was a bit low so to avoid getting in a hole I slowed a bit. I still managed to find myself lower than I liked, at times, while negotiating the first two turnpoints. Conditions were beginning to get a bit turbulent near the ridge due to the normal afternoon winds. At one point one of the competitors took a big asymmetric and cravatted . He successfully threw his reserve chute and landed unscathed on Hill 49917. As we all headed across the valley to the Squaw Valley turnpoint, we were glad to be leaving the ridge. There was some nice lift during the leg to Lindsay. I was running between (back and forth) two small gaggles – trying desperately not to fly alone. As we worked our way down past Antelope Valley (yesterday’s goal) I found one of the best climbs of the day. The thermal was big and strong and took me to 6200’. This allowed me to head South on 1/4 bar with 50km or more groundspeed. The winds were gradually shifting to the NW and looking like a tailwind at certain altitudes. I took any climb over 300’/min. and watched the miles tick away for the last 20 miles of the flight. I crossed Woodlake high and had to decide on a line from Woodlake to Lindsay. I started with a direct line, but soon decided to dive into a large field with burning stump fires for a much needed climb. I was below 1000’ agl when I arrived at the field but was able to core a rough 300'/min. smokey climb to 4000.' This gave me a 10:1 glide to goal for a short time. I knew I needed a bit more of a climb but now I had Rocky Hill made and I knew that there were usually thermals over this hill since I have flown RC gliders over that hill. I didn't connect with any decent lift and fought the fight, but ended my flight 3.6km short of goal. We had 21 in goal on a day when noone thought we'd fly 30km! We've had quite a struggle to get back to camp before 9pm this week, but some improvement has been made. That, along with the archaic internet connection available at the facility has made updating this blog impossible unless I sit outside a gas-station before breakfast. The weather looks good on Thursday so I'm looking forward to more good flying. The comp has has some rough edges with regard to organization, but the site has proven itself worthy of great flying and adequate facilities to host a comp.